One reason I’m “uncomfortable” using common names of plants is that it’s very easy to call a group of plants by one name. Sometimes this leads to the group being associated as one plant and the benefits of others in that group may go unnoticed. Over the last few years there have been some great improvements and new introductions of some varieties of plants that may carry the SAME NAME but THEY ARE DIFFERENT… Very Different!!! Sometimes called a benji, or just plain ole Ficus. They are all in the ficus family… true. 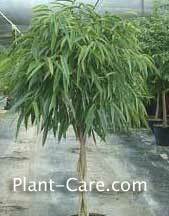 Ficus benjamina was and has been the major variety grown, and still is today. It’s unfair to “think” of all these plants as just another Ficus or as another benjamina , as I said they are different. I won’t go into the differences check them out for yourself at www.ficustree.com. The names are not just to be different or confuse. Each and every one has been selected and grown because it meets a certain indoor condition(s) such as those mentioned above. What about other plants? I’m glad you asked. Let’s take the umbrella tree also known as the Schefflera. This plant has been grown for years but there has been a new introduction which goes by the name ‘Amate’. Schefflera ‘Amate’ holds up better in lower light, is more resistant to disease and less spider mite problems. The popular Fasicata is commonly known as “The Silver Vase”. Ten years ago the Fasciata grown had small spines running down the leaves. A new introduction Fasciata ‘DeLeon’ has more silver on the plant but is also spineless. How can you identify these plants? Most of these new plants come with plant tags. Take a look at the names and get familiar with these new plants. You’ll notice that most are also patented varieties. So you shouldn’t propagate them. You can expect to pay a little more for these “new” old plants. But these plants have been selected for their improved indoor qualities. So next time you’re walking through your favorite plant place don’t look at these plants as the same old ficus or umbrella tree, look a little farther and find out their names. Try to find out what makes these plants different. Do they need less water, or light, etc. You could be missing out on great new plants, that will do much better in your home. These plants are not the SAME NAME they’re DIFFERENT PLANTS. I realize that it’s difficult to learn all of these “new” plants. Don’t forget you can always do a search for a plant on the site… the Search box is in the middle of the sidebar. Patented Plant Varieties: Are They Superior?